And most of them are women! I read this novel many years ago & then didn't read any Cather until I read her letters which sent me on to a few more of her books. Now I'm going back to the novels I read when I was young & rediscovering them. At least Cather's work is in print which is great. I love Willa Cather. There's a quiet beauty to her writing that I really admire. I've read several of her novels, but this is one of my favorites. Great review! Thanks, Lark. 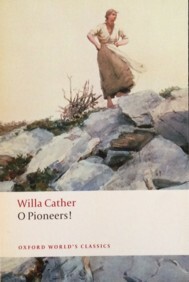 I'm looking forward to reading more Cather. I've read several of Cather's novels and one she wrote about writing. But you've reminded me that there are more of her books to read. I still have a couple of her books unread plus a few I read as a teenager that I want to reread. Such an interesting woman. Her letters were wonderful & I'd like to reread the biography by Hermione Lee (another book I read a very long time ago). I did my literature (university level) research paper on My Ántonia. I was honored by my professor who noted that my paper was the best research paper he had seen in over 10 years and asked my permission to use my paper as a sample of a PERFECT research paper. I was very honored, to say the least. Unfortunately, after a move out of state, I accidentally lost all my copies of my research papers during this move(all of which were graded A, or A+) from those years. I was a non-traditional student and in my early thirties, going to school after a divorce for accounting so that I would have a good career to always fall back on (bookkeeping ) as I didn't actually want to be a CPA per se.... Anyways, I totally loved Willa Cather's novels. What a shame to lose your papers but you do have the memories of your achievement. Cather is one of my favourites.